The ethical creatives will set up on Manners Street for two months. 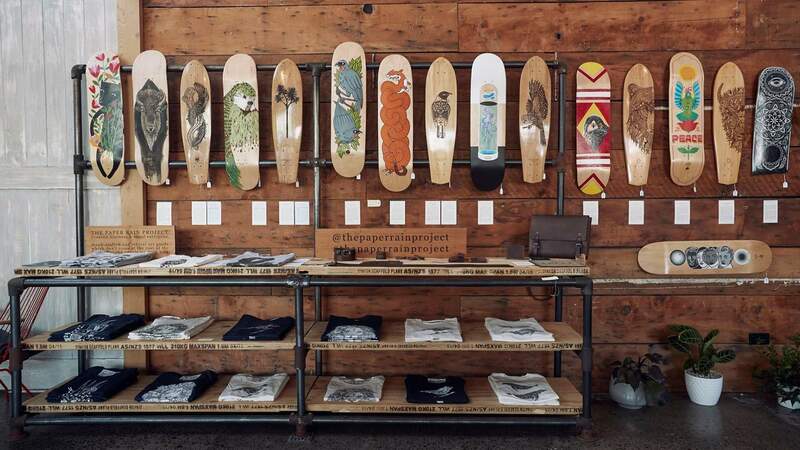 The folks at The Paper Rain Project are always up to something good, whether it be saving the whales, or making wishes come true with skateboards. Growing from a small idea in 2009 to sell hand-painted longboards, Paper Rain now makes a wide range of creative products to support good causes. All of the merchandise is organic and fair trade, complete with stunning designs from local artists. This winter, the initiative is treating us lucky Wellingtonians to a pop-up shop, stacked full of stylish apparel and stunning artworks. The doors will open at 64 Manners Street on 15 June, and will stay open until early August. This will give you plenty of time to pick up an intricately etched macrocarpa board as your next statement wall piece. There will also be stacks of shirts, beanies and hoodies, to complete your winter wardrobe. If you want to get more involved, there will be an official launch night on Friday 22 June. In true Paper Rain fashion, there will be a celebration of local creativity with flows of local brews including Scapegrace, Garage Project and Karma Cola.